Visual Studio Code>Other>indent-rainbowNew to Visual Studio Code? Get it now. This extension colorizes the indentation in front of your text alternating four different colors on each step. Some may find it helpful in writing code for Nim or Python. It uses the current editor window tab size and can handle mixed tab + spaces but that is not recommended. 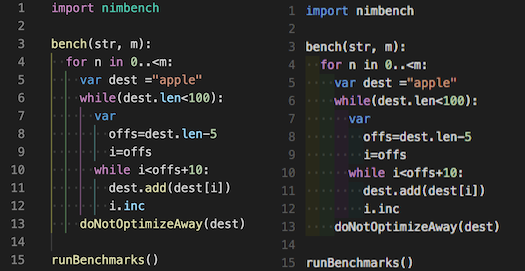 In addition it visibly marks lines where the indentation is not a multiple of the tab size. This should help to find problems with indentation in some situations. // The indent color when there is a mix between spaces and tabs. // To be disabled this coloring set this to an empty string. Notice: errorColor was renamed from error_color in earlier versions. Running npm run compile makes the compiler recompile on file change. If you like this plugin, please consider a small donation!